The paint to the right of this text was done for the Toxic Terror Tour. I had bought red paint, but I wasnt sure what I was going to do with it. I've gone through various paint styles over the years, so sometimes its hard to come up with something original. 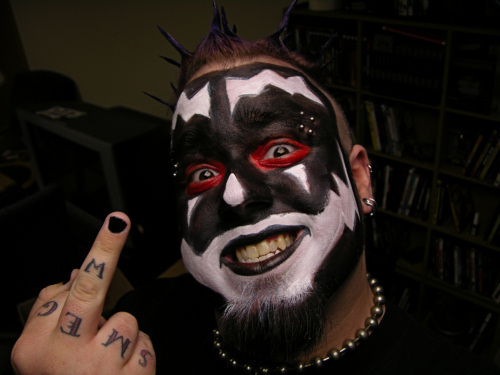 And I like making it original, nothin like going in violent j paint, and everybody there is in violent j paint. I'm always tryna keep it fresh. "Sometimes people need things listed out and explained for them. Sometimes you might find something extra if you take the time to read." "Regret is for somebody who doesnt understand that mistakes must happen in order for aperson to further himself through life. I've made some mistakes, but with what I knew at the time, I couldnt expect myself to handle the situation any differently than I did. I can apologize for the situation I put another person through, but I can't go back and make it happen any differently. Everybody makes mistakes. If people can't understand that, they aren't your friends." "Unexpected sometimes pop up in life, and only thing you can do is wish for the best. Unexpected things also tend to ruin things you've worked for." "Tattoos and piercings are all about personal expression. A way to look how you want to look. I way to be your own unique self. I would never in my lif e regret any of the tattoos I've gotten." "You can have an opinion but it doesnt mean it's written in stone. An opinion isn't important enough to have a fight over, although we all can let that get the best of us sometimes. I guess some peoples opinions are written in stone instead of pencil." "Friends come, Friends go. Friends change, Friends Grow. Its really not a simple explaination, why some Friends last, why some friends leave. If you're not totally truthful and honest up front, later on in the friendship it all builds up and you realize all that you built the friendship on, was never there. You just have to accept that its very possible your best friend w on't be your best friend forever. I've had many best friends come and go. And you start to ask yourself ... How much does my friend care about me?" "there are many girls out there to love, many girls who will love you back. And even though you may not realize it, there is always a girl out there who may be more perfect than the last. It is not whether you are satisfied enough with her. . . the real question is, Do you really love her? When you're in love, you don't care about something more perfect, you're happy with the one you're with." "It's not that a certain kind of music you hate is crap, its that the certain kind of music you hate, you do not understand, and will not try to understand. People are not born hating rap, hating country, or any other genre, we make our own choice not to like it, not to listen to it. Not to give it a chance "
"Everybody has to have something in their life that they look forward to. Whether its music, religion, or family. This for me is all three." "Life can be random and interesting sometimes. People you meet, things you see. This is a page dedicated to those events and the pixels they've left behind"